Quick, easy, packable, healthy, filling lunch idea. Yes, all of that. So I just had to share my latest love. 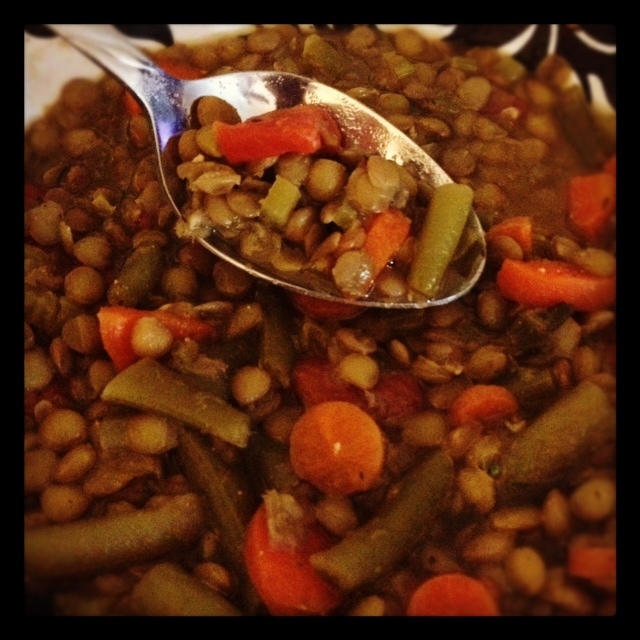 I have been making a BIG batch of lentil vegetable soup and then using it for lunches. Hubby and I both prefer to take lunch to work with us, but it’s often a struggle about what to take. Mainly because we want it to be healthy but also convenient. Good luck with that. So I made my own masterpiece. Lentils are very filling, have lots of protein, and are the kind of starch that helps increase your metabolism and make you happy. 🙂 Plus, they’re inexpensive and easy to do all sorts of fun stuff with. Adding all the veggies is a great way to get those servings in and add some interesting flavors, too. I make a big batch of this soup, dip out 4 individual servings into glass to-go containers. Then I freeze the rest because I know we don’t want to eat the same lunch for like 10 days straight. So we eat the 4 containers (2 days since there’s 2 of us) and I find something else for us to take for a few days, then thaw the rest and take it the next week for a few days. It’s super satisfying and tasty. Does it look yummy? Want to re-create it? I used a bag of dry lentils, a couple of fresh tomatoes, a few stalks of celery, a bag of frozen green beans, 4 carrots, vegetable stock, olive oil, lots of cumin, garlic, salt, pepper, green onion, and thyme. AND you could mix it up. I just bought swiss chard to put in my next batch. Soften the onion, garlic, etc in your olive oil on medium heat. In the meantime, cook the lentils according to package instructions. Add drained, mostly cooked lentils into the pot that has the garlic. Add your stock & veggies and spices, bring to a soft boil and then simmer for…well, however long you got. Shoot for 30 minutes or so at least so the flavors marry. What’s your go-to healthy, packable lunch?